News journalism is about bringing new information to the reader as quickly as possible. The fastest way may be a video, a photo, a text, a graph, a table or a combination of these. Concerning visualizations, the purpose should be the same: quick information. New data tools enable journalists to find stories they couldn’t otherwise find, and present stories in new ways. 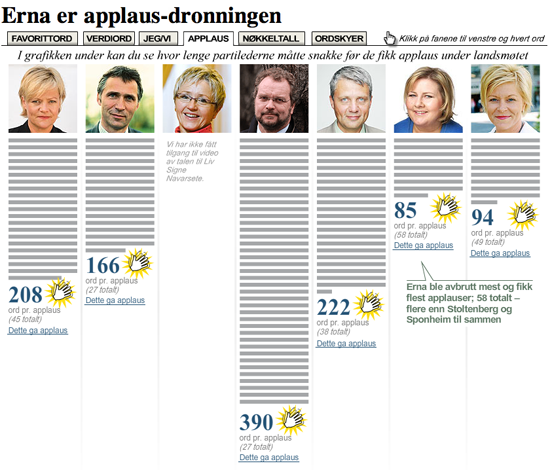 Here are a few examples showing how we serve data at the most read newspaper in Norway, Verdens Gang (VG). This story is based on data from the Norwegian Bureau of Statistics, taxpayers data and data from the national Lotto monopolist. 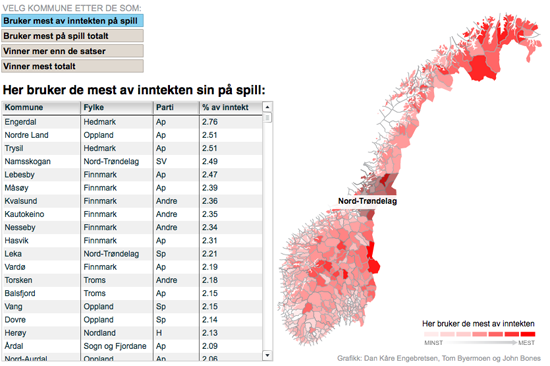 In this interactive graph, the reader could find different kinds of information from each Norwegian county and municipality. The actual table is showing the percent of the income used on games. It was built using Access, Excel, MySql, and Flash. 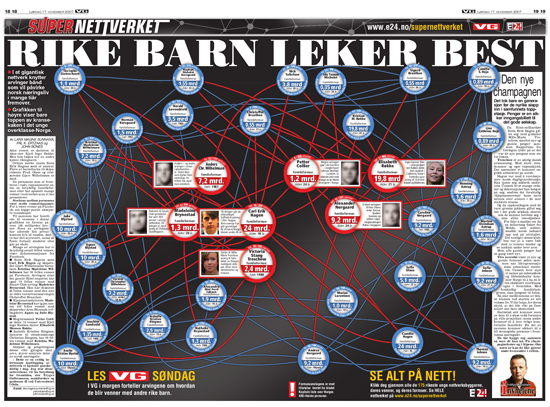 We used social network analysis to analyze the relations between 157 sons and daughters of the richest people in Norway. Our analysis showed that heirs of the richest persons in Norway also inherited their parents' network. Altogether there was more than 26000 connections, the graphics were all finished manually using Photoshop. We used: Access, Excel, Notepad, and the social network analysis tool Ucinet. 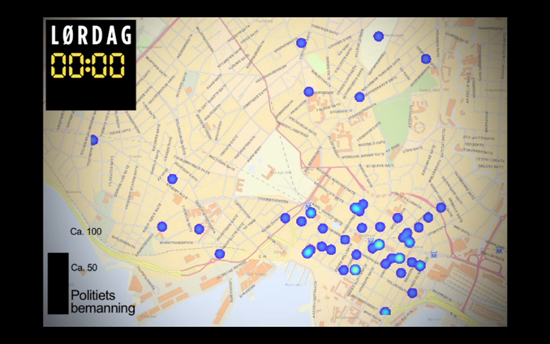 In this animated heatmap combined with a simple bar chart you can watch see crime incidents occur on a map of downtown Oslo, hour by hour, over the weekend for several months. In the same animated heatmap, you can see the number of police officers working at the same time. When crime really is happening, the number of police officers is at the bottom. It was built using ArcView with Spatial Analyst. When do we need to visualize a story? Most of the times we do not need to do it, but sometimes we want to do so to help our readers. Stories containing a huge amount of data quite often need visualization. However, we have to be quite critical when choosing what kind of data we are going to present. We know all kinds of stuff when we report about something, but does the reader really need to know for the story? Perhaps a table is enough, or a simple graph showing a development from year A to year C. When working with data journalism, the point is not necessarily to present huge amounts of data. It’s about journalism! There has been a clear trend in last 2-3 years to create interactive graphs and tables which enable the reader to drill down into different themes. A good visualization is like a good picture. You understand what it is about just by looking at it for a moment or two. The more you look at the visual the more you see. The visualization is bad when the reader does not know where to start or where to stop, and when the visualization is overloaded by details. In this scenario, perhaps a piece of text would be better?